Dog Mountain is considered a "signature hike" in the Columbia Gorge, and for good reason. It is a 3,000-foot climb, most fitting to the area's steep terrain. There are breathtaking views of the river and surrounding mountains, and during the wildflower season the display is spellbinding. The best time to visit is around Memorial Day. I usually make a trip a couple of weeks before to be sure of not missing the flowers if they are a bit early. 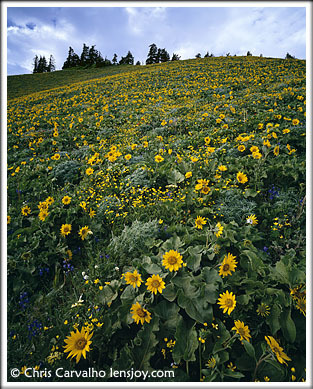 In the spring of 2003 I took my 4x5 camera up on a promising day and found a mother lode of golden flowers. This year the blooms of balsamroot (the yellow daisy-like flowers) and buttercups were both at peak; an unusual event. I was fortunate to have soft light and the air was relatively calm that day. The scene was truly spectacular, and matched my best memories of the flower display. This print is richly detailed and shows at least ten different kinds of wildflowers. The sea of balsamroot blossoms stretches hundreds of feet up the mountain; yet individual flowers are still visible at the ridge top. In addition to Balsamroot, some of the ones you'll see are Indian Paintbrush, Prairie Star, Larkspur, Lupine, Rock Penny Cress, White Western Groundsel, Maiden Blue-Eyed Mary, and Desert Parsley. While it may seem that good luck is the way to get such a beautiful photograph, a lot of work is also involved. I have visited the area with camera gear for several years now, making four or five trips each spring at the peak bloom time. It's not an easy task to carry forty or more pounds of equipment up the mountain on each visit, but the victory is that much sweeter when I'm rewarded with a perfect day. I hope you can make the hike and see one of the Gorge's true treasures.